Kopachuck State Park sits 45 Miles south of Seattle, 30 miles south of Bremerton and 45 miles North of Olympia. It’s a ten-minute drive west of the town of Gig Harbor, but as its address reveals, it actually is within Gig Harbor’s borders; Kopachuck State Park, 11101 56th Street, N.W. Gig Harbor, Washington State. Its phone number is 253-265-3606. Kopachuck is a 109-acre marine and camping park, shaded by tall Douglas fir trees, with 5,600 feet of saltwater shoreline running along Henderson Bay. The park’s 1,500 foot sandy beach draws most visitors, offering activities like wading, building sand castles and exploring the marine habitat. Children and grownups will be amazed at the huge Dungeness crabs, sea stars, and sand dollars on the beach. There’s also salt-water swimming, relaxing on the sand, crabbing, clamming, and digging for oysters. Low tide is the time to head for the beach at Kopachuck. That’s when the usually steep and rocky beach transforms itself into a flat luxurious sandbar. Getting to the beach requires a short 1/8-mile trek down a hill. People who might have difficulty navigating the hill can be driven or contact the park staff to make transportation arrangements. This park also has its very own 5 1/2 acre island, named Cutts, also called Deadman’s Island, which is about half a mile from shore, and can only be reached by private boat. Cutts Island has an underwater park with an old barge that was sunken there years ago, to attract fish and marine invertebrates. Scuba divers regularly explore the site. 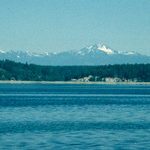 The park offers stunning panoramic views of the sun setting, the snow-capped Olympic Mountains and Puget Sound. Kopachuck is popular with its neighboring residents, and is considered to be one of Puget Sound’s most beautiful parks. The park provides a wide variety of activities. There are two miles of hiking trails, a sports field good for volleyball, bird watching is popular, fishing is done off shore, along with boating, water skiing, scuba diving, and jet skiing. During the summer one-and two-person kayaks can be rented by the hour right on the beach. A Junior Ranger program offers beach walks for children ages 12 and under in the spring and summer. Rangers lead the group, explaining the marine habitat and environmental features. Walks are arranged by appointment through the park ranger office. The campsites at Kopachuck Park are completely surrounded by old growth forests, providing a deep-woods camping experience. And although the park is fairly close to civilization, visitors say it seems like it’s millions of miles away from anything because of the huge trees. There are 41 sites, and two tent-only group areas, which can hold up to 20 and 35 people respectively. The park provides four kitchen shelters equipped with electricity, plus 16 sheltered and 76 un-sheltered picnic tables with fire grills and firewood, good for picnics and barbecues. These are offered on a first-come, first-served basis. It’s a maximum eight people per campsite. Of the three restrooms, two have showers. The campgrounds are open from late April to early October. Kopachuck State Park was originally the fishing and clamming spot for the Puyallup and Nisqually Pacific Coastal Indians. The park name comes from their trade language, known as “Chinook Jargon”. Kopachuck is actually two Chinook words linked together, “Kopa” which means “at” and “chuck” which is water. Kopachuck State Park is open during the winter months, from 8 a.m. to dusk, but the temperatures are bearable. Highs during the day are in the 40’s, and when the sun goes down, things cool down a bit to the 30’s. The state employs one person who lives at Kopachuck year-round to provide maintenance and park security. Harbor, you may also want to stop at the legendary Tide’s Tavern. It is directly on the water, in a time worn building that originally housed the general store. It is the local hot spot for drinks, darts and live music since it opened in the 1930’s.